Each Acrobranch park is outfitted with EU-marked safety gear, imported directly from Europe, because safety is of paramount importance to the company. You will receive a safety briefing before you meet your first obstacle. 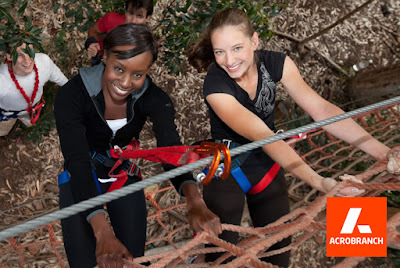 Walk on high ropes among the treetops, navigate tunnels, walk across bridges and walkways, and conquer tricky crossings. Top off two hours of adventure with some of the spectacular ziplines on offer. Acrobranch is the ideal venue for a children's birthday party. They can balance, swing, explore, climb and abseil to their hearts' content. And who's to say you have to be under the age of 18 to have a birthday party at Acrobranch? Even adults enjoy the canopy tours and the four adrenaline-fueled obstacle courses. Take the family for a day out at Acrobranch and see why companies choose this venue for business outdoor team building activities. It will create awesome, unforgettable experiences for your family, employees and colleagues alike. Book your outdoor obstacle course experience in Melrose (Johannesburg), Honingnestkrans (Pretoria North),Irene (Centurion), Constantia (Cape Town) or Wilderness (Garden Route) today. This package includes the Swinging Tarzan Obstacle Course which is graded as moderate. Be prepared to test your agility and climbing ability to the limits, as you take on this course which offers a far greater challenge, than is first perceived. This package allows for 4 x participants age group, 10 years and up. Total obstacles differ per region. Venues are open from Wednesday to Sunday as well as public holidays and school holidays. Restaurant/picnic facilities differ between venues, to be confirmed at time of booking.